Once upon a time was a little girl whose friend, a german shepperd called Athos, trained her to walk. Eight years long, they were inseparable. Around her lived many other animals, hens, ducks and gooses and some you would say they came from Noah's Arch : a fennec, a monkey, foxes, horses and birds of all kinds. 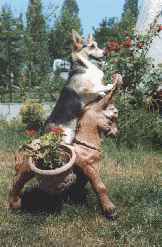 Overall they were dogs, especially germand sheperds but some from other breeds as well, small and bi gones. 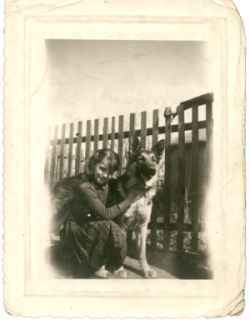 All these animals live with her whils her youth and this is where her love for animals - and particularly dogs comes from. As a child, she discovered the pleasure of reading. She was very found of Pearl Buck's novels about China, which leaded her to Pekignese. From that love began her Pekignese kennel which last for 20 years. When her last Pekignese called Tai-Chong died, she thought she would never have one again but finally promised her youger son to have another small dog because he was so sad. However, she did not know which breed yet. Later, she met a stange kind of foxy dog whilst walking on beach in Normandy. 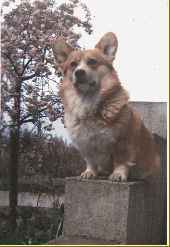 That was a Welsh Corgi. You are welcome to discover my passion and my Pembroke and Cardigan Welsh Corgi, friends of a life. Thank you to all my friends who helped me and who still do, and to all of you who share my love for Corgis.